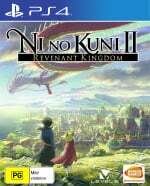 Higgledies are a big help throughout Ni no Kuni II: Revenant Kingdom. These little elemental creatures back you up in combat with special skills and abilities, but they can be tricky to find and recruit. There are 30 higgledy stones scattered throughout the game, with each stone giving you access to a new higgledy for your party. All of them are hidden in dungeons, which means that you won't find any on the world map, in towns, or in the Dreamer's Maze. Once a stone is found, you'll need to present a specific item. You're given a hint as to what this item is, but sometimes it's still not totally clear. In this guide, we'll be walking you through each stone's location, and we'll let you know which items you'll need to offer. Note that some stones can't be accessed until you reach certain points in the game. They may require the use of a vehicle or environmental magic spell. You'll visit Cloudcoil Canyon during the story. Filigree the Flighty: This stone is easily spotted as you progress through Cloudcoil Canyon. Present a munchy nut (found in Cloudcoil Canyon/Snaketooth Ridge). Larrican the Leafy (only obtainable someways into the story): After entering Cloudcoil Canyon from the South, activate the first whirlwind plant on the left and follow the path. Head up the cliffs on the right using more whirlwinds. The stone is located on the far wall. Present a prism pepper (found in Heartlands/Runaway Cave). You'll visit Wyvern's Den during the story. Tove the Tenebrous: Follow the path then turn right. The stone is up against the wall in the corner. Present some single cream (found in Calmlands/Unsung Shrine). Tightfit Cavern is located far to the North of Evermore. Frumious the Flammable: From the entrance of Tightfit Cavern, simply follow the left wall and you'll find the stone. Present some hardwearing wool (found in Calmlands/Swift Solutions). The Jumblewoods are located South of Evermore, then West. Twinkle the Twee: From the Jumblewoods entrance, head down the path to the right. Head right again once you see the strange higgledy man. The stone is up against the wall on your right. Present some rugged fur (found in Rolling Hills/Cloudcoil Canyon). Popple the Pure: From the Jumblewoods entrance, head down the path to the left. Take the next path to the right until you reach a dead end. The stone is pretty much straight ahead against the far wall. Present a slumbergull feather (found in Pinwheel Flats/East Wood). Crosswater Carvern is North of Auntie Martha's cottage. Motley the Menace (only obtainable someways into the story): Enter the cavern and keep going forward until you reach a fork with two paths. Head right and then turn right again once you find a more open area. The stone is tucked away in the corner. Present some snow-white thread (found in Rolling Hills/Cloudcoil Canyon). You'll visit the Hard Woods during the story. Phantasmagoria: Near the final save stone in the Hard Woods near the boss area, go back to the previous clearing. From there, head left and follow the path. Take another left and the stone is found to your right in the next clearing. Present a nightmare prism (found in Swift Solutions/Faraway Forest Cave). You'll visit the Auld Woods during the story. Mutton-Bane the Mushy: Right outside of the Dice Factory where you fight the boss, the stone is located to the right of the building against the wall. Present some gunkshrooms (found in Forest of Niall/Budding Lumberyard). Shiverwood Shrine is located just South-East of the Forest of Niall. Dirge the Dismal (only obtainable someways into the story): Enter the shrine and take the first left. Follow the path and take the next right. The stone is straight ahead across the room. Present a twisty bone (found in Leucippes' Labyrinth/Pinwheel Flats). Crooked Cavern is located at the top right of the leftmost continent on the world map. Slithy the Spelunker: Enter the cavern and follow the path all the way in. Ignore the first path to the left and keep going straight. When you're presented with three possible paths, take a right. Down this path, take another right into a small dead end. The stone is there. Present a glacier crystal cluster (found in Abyss/Mining Camp 4). The Unsung Shrine is located to the far East of Goldpaw. Whiting the Lightning (only obtainable someways into the story): Enter the shrine and head right. Take the next left, follow the path, and the stone is straight ahead across the room. Present some heavenly wonderwater (found in Rolling Hills/Tumbledown Shrine). Death's Door is located South of Goldpaw. Gabardine the Gawker: Enter the cave and follow the path. When you come to the first room, head left into a dead end where the stone is. Present some knight's brocade (found in Drylands/Bleachbone Shrine). Hidey Hole is located to the North-West of Capstan-upon-Hull. Mimber the Meanderer: The stone is located on the right wall of the cave. Present some sackcloth (found in Calmlands/Reight Bright Beacon). Dampshoe Cave is located just South-East of Hydropolis. Tundle the Tropical (only obtainable someways into the story): Head into the cave and take a left. Follow the path all the way in and then take another left. The stone is on the left wall of the room. Present some coral huebloom (found in Rolling Hills/Cloudcoil Canyon). Seaspray Tunnel is directly South of Hydropolis. Dishcloth the Dragony: Head into the cave and the stone will be to your right against the wall. Present some briar coral (found in and near water/Makronos). You'll visit the Abyss during the story. Haddock the Fishy: In the 1000 Fathoms deep area of the Abyss, head left. Follow the path down and around and you should find a water slide. Ride it across to the far side, and jump down to the middle ledge on your map. The stone is here. Present a bright button (found in Makronos/Abyss). Clambunctious the Clam: In the 3000 Fathoms Deep area of the Abyss, use the water slide that's south of the save stone. The stone should be just to the left of where you land. Present a bighorn shell (found in Reight Bright Beacon/Fine Fish Market). Bleachbone Shrine is located to the far South of Broadleaf, in the canyon. Teakettle the Toasty: Enter the shrine and head left, then left again. Take another left and the stone is found at the end of the path. Present some fluffy cloth (found in Drylands/Swift Solutions). Sunshade Shrine is located to the south of Broadleaf, in the canyon. Vorpal the Volcanic (only obtainable someways into the story): Enter the shrine and head left when the path splits. Take the next left, and then head right. Go right again to find the stone in a small dead end. Present some sunnysmile cotton (found in Wondrous Bazaar/Faraway Cave). The Shrine That Time Forgot is located West of Broadleaf. Boss-Woss the Bruiser (only obtainable someways into the story): Enter the shrine and follow the path to the first room. Keep going straight ahead to another room. The stone is straight on near the far wall. Present a bolt eagle feather (found in Nazcaa/Belly of the Beast). The Sublime Shrine is located just North-East of Broadleaf. Unkimmon the Uncommon: Head into the shrine and take a right, then a left. Follow the path, take a left, and then a right. The stone is at the dead end. Present some coarse-grained lumber (found in Makronos/Abyss). The Fathomless Forest is located North of Broadleaf. Bumblebizz the Blowy: Enter the forest and follow the path all the way in. The stone is in a dead end to your left. Present some fine fur (found in Abyss/Pinwheel Flats). You'll visit the Broadleaf Dynafloor during the story. Topturvy the Testy: On level 2, you'll have to reposition some platforms in order to get to this stone. On the map, it's located in a dead end near the bottom left, near what looks like a missing circle on the map. Present some scented sap (found in Pinwheel Flats/East Wood). Slingsby the Scorcher: On level 3, you'll have to reposition some platforms so that you can reach the top of the map where the stone is located. It's just off to the right. Present some whole milk (found in Rolling Hills/Grotty Grotto). The Ice House is located North-West of Broadleaf, in the snowy region. Malignity the Indignity (only obtainable someways into the story): Head into the shrine and follow the path to its first split. Keep going forward and you should hit a dead end where the stone is. Present a strudy bone (found in Wiggly Way/Forest of Niall). Freezybones Cave is located North of Broadleaf, in the snowy region. Benison the Bright: Enter the cave and head straight on. Follow the path all the way until you come to a room. The stone is found to the left in the corner. Present an enigma prism (found in Swift Solutions/Mining Camp 4). You'll visit the Old Well during the story. Bawbee the Bandit: Enter the Old Well from the South and take the first right, then the second right. Take the third right and you'll find the stone against the wall in the dead end. Present some blossomwheat (found in Pinwheel Flats/East Wood). Dimity the Dastardly: Past the second save stone, take a left, then a right. Keep going until you find a dead end to your right. The stone is there. Present a forked tail bone (found in Drylands/Jack Frost's Playgound). Tumbledown Shrine is South-West of Ding Dong Dell. Tilly-Loo the Twinkly: Enter the Shrine and head right. Take the next right and follow the path to the next fork. Turn right again and the stone is straight ahead against the far wall. Present some clear prisms (found in Swift Solutions/Mining Camp 1). 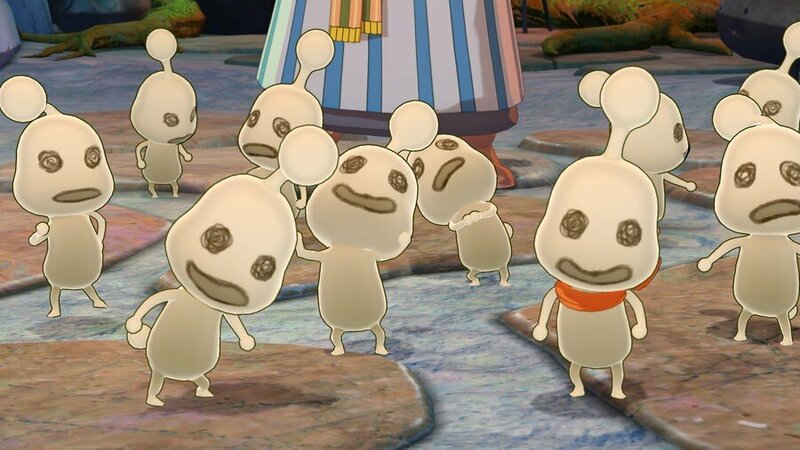 Are you after all of the higgledies in Ni no Kuni II? Make your best higgldy sound in the comments section below. Great guide, thanks. I can't find a prism pepper for the life of me, though. Ugh.